an image of the vegetable preparations abandoned. A feel of the potential of a warm broth in winter. 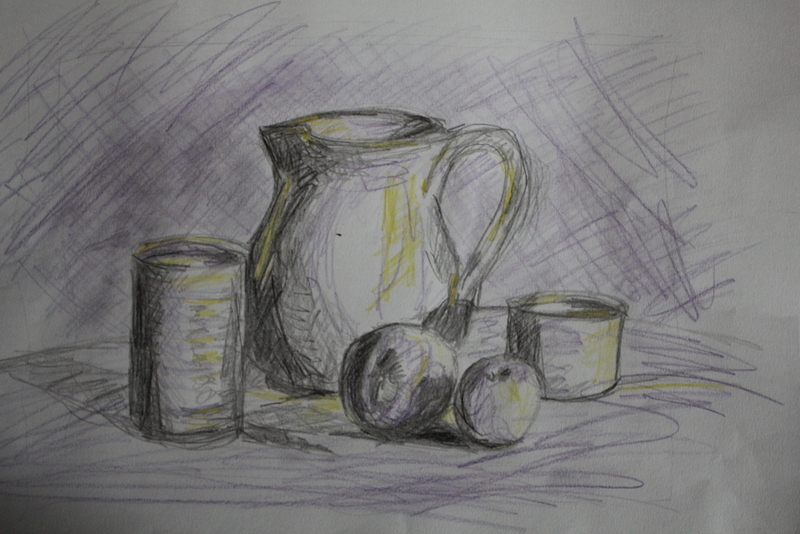 The darker still life set against a bright (snowy) background, so with a lot of contrasting tone but not in heavy block shading. 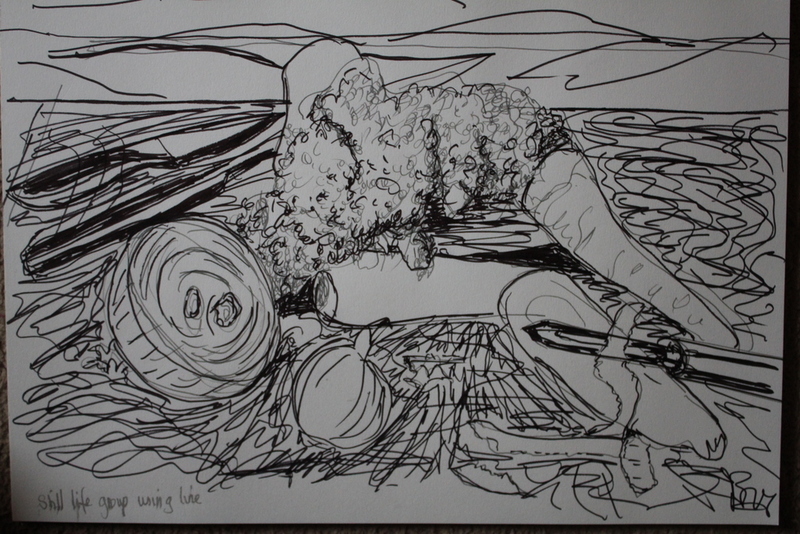 who uses varying pressure in a pen and ink sketch to produce differing lines in intensity and shape so leading to impressions of the sea or rocks. It has a relatively rustic and barren feel, probably due to the lack of features in the background, which I like. 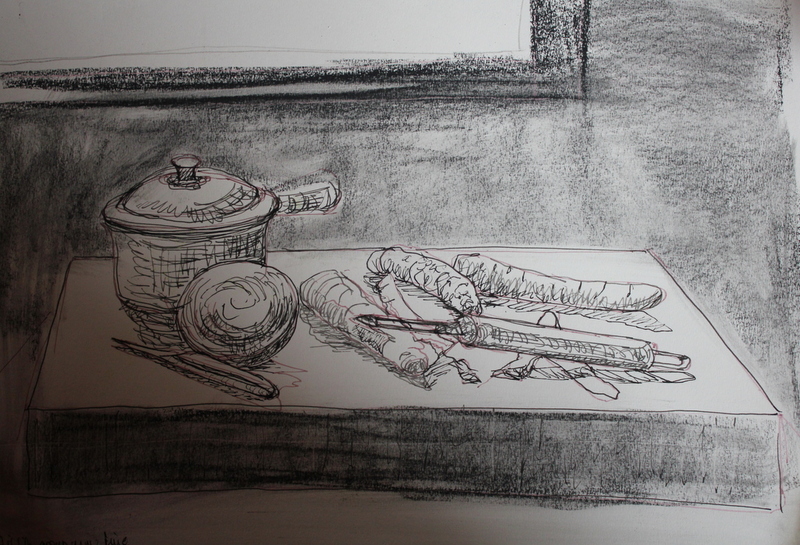 This I prefer-I have used pen ink (which flowed more freely) and 5B pencil to help mark out the vegetables from the pattern of the chopping board, by a hint of shadow. There is a greater flow around the picture, there is a sense of pattern and activity and of texture. Perhaps the backgroundis a little too distracting and would benefit from greater contrast. 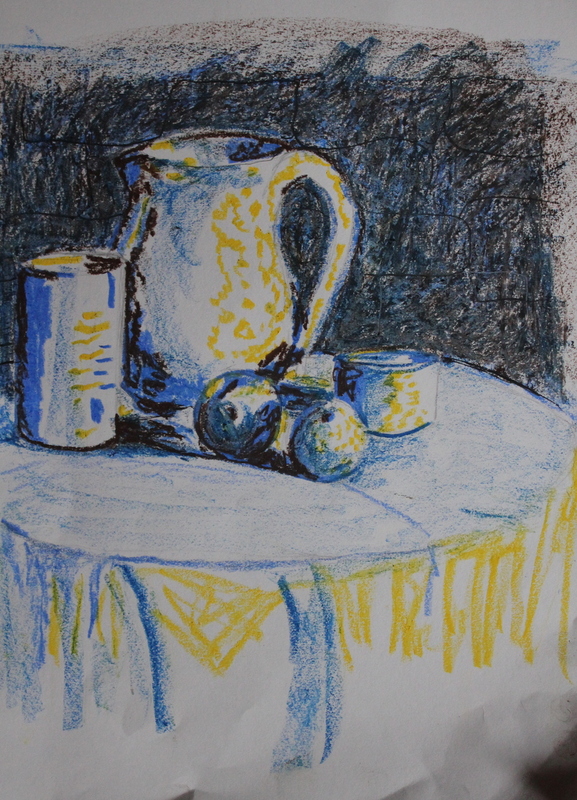 One more still life, in ink pen and felt tip-( before I cook it for tea), trying a Passmore style which consists of swirls of lines contrasted against blocks lacking feature except in their outlines: A few more articles added and the viewpoint changed to lower. I didn’t achieve what I set out to initially but almost a landscape in this final picture–much more exciting than the domestic scene. this first is drawn with pencil crayons, black,purple and yellow: I felt this version had a better composition than the larger version in wax crayon and I liked the “quiet” of the pencil hatching, however it felt lifeless-perhaps due to the lack of detail on the articles and in the background-it did however capture the tonal variations better and the crispness of the foreground objects in comparison to the background. what aspects of each drawing have been successful and what did you have problems with? The overall pattern prouced by a line drawing is interesting in itself but without tone and shadow it is not easy to determine the position of objects in relation to each other and their background. 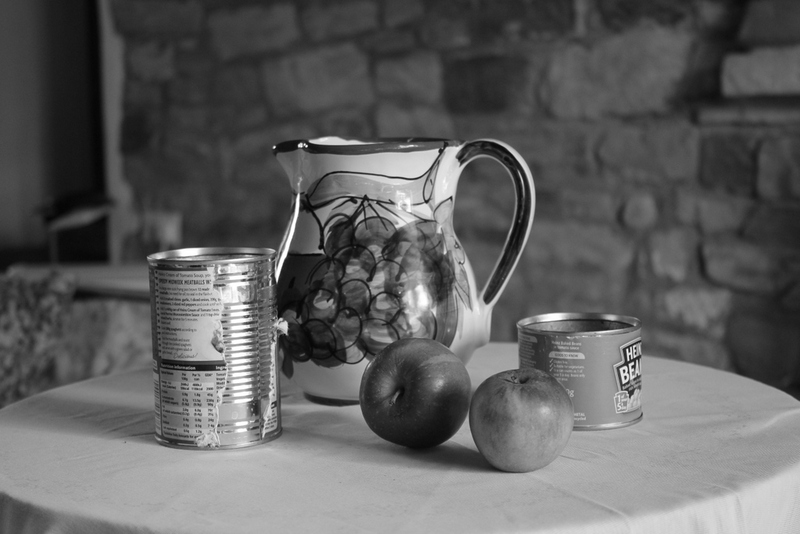 The tonal representation via colour was complicated by my inability to assess the background tone in relation to the still life, but was helped by the black and white photo. 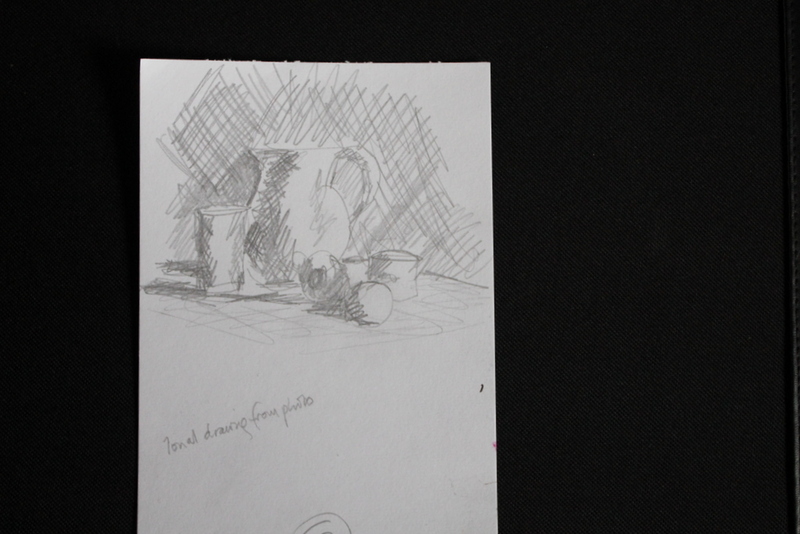 The tonal pictures gave a greater sense of depth as they represented the shadows on the objects. 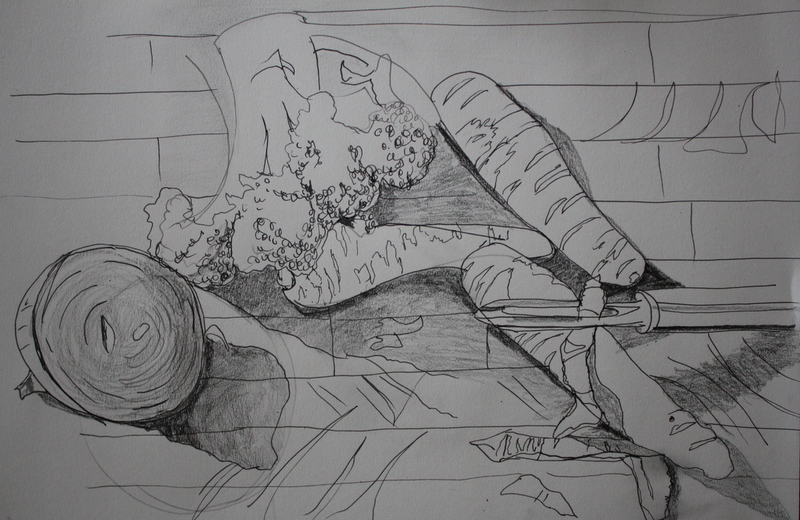 The linear drawing was dependent on the overlapping of the objects and the representation of some shadow in producing depth. Line does not always produce a clear likeness, partly due to a lack of depth and three dimensionality. Tone: I find it difficult to clearly differentiate the levels of tone and, as I used only three colours to produce tone it was restricting even further-although the differing intensity of pressure on the crayons helped.